The Educational Wheel Driver & Learn is a role-playing game by Vtech. The goal is to train your little one by learning the first safe driving rules and not only! Its intense coloring and design, suitable for small hands, will instantly attract the attention of the child. 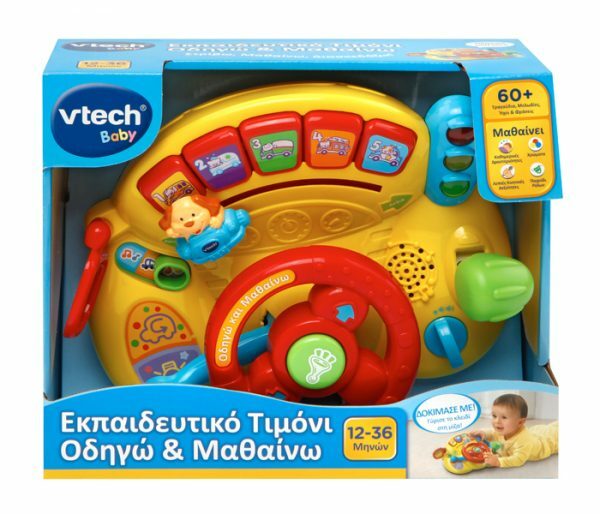 At the same time it will introduce it to the joyful world of animals, colors and numbers, as well as vehicle recognition, through fun phrases and realistic car sounds all in Greek! Your little one can turn the wheel to move the mini- car with the puppy and learn the different vehicles and their sounds. Tap the large rectangular buttons to hear fun phrases. With interactive buttons, including a lantern, starter key and steering wheel with a puppy doggy. 5 buttons learn child music, shapes, animals, colors and numbers in Greek. Unbreakable mirror for safe play. It plays 10 melodies and 2 songs to sing in Greek with your child.